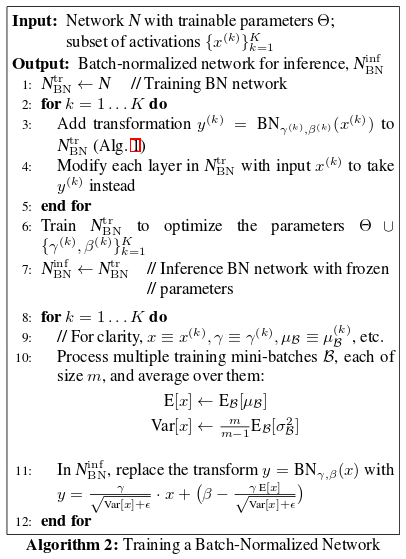 In a recent paper published on arxiv by Sergey Ioffe and Christian Szegedy, a technique for accelerating deep neural network learning called batch normalization was introduced. They suggest that a change in the distribution of activations because of parameter updates slows learning. They call this change the internal covariate shift. The paper proposes an efficient method to partially alleviate this phenomenon. During SGD training, each activation of the mini-batch is centered to zero-mean and unit variance. The mean and variance are measured over the whole mini-batch, independently for each activation. A learned offset β and multiplicative factor γ are then applied. This process is called batch normalization. The formal algorithm is shown in the figure below, reproduced from Ioffe and Szegedy’s arxiv paper. 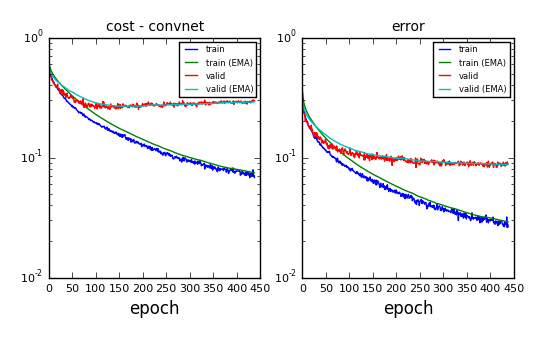 Once SGD learning has stopped, a post-training step is applied where the mean and variance for each activation is computed on the whole training dataset (rather than on mini-batches). This new mean and variance replaces the ones computed on mini-batches. The whole training procedure is shown in the figure below, also reproduced from Ioffe and Szegedy’s arxiv paper. Implementing this is quite simple in theano. In liblearn, I made batch normalization a new type of layer with a “post-learning” operation. That’s it! The following shows the exact architecture of the model tested. Except for the new batch normalization layers, the model I tested is the exact same as the one of my first post. Therefore, let’s compare both results. To do this comparison, I took the best model I trained with and without batch normalization. 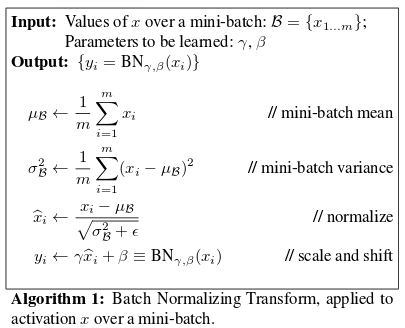 and the figure below shows the same evolution for the model with batch normalization. Though it might be a bit confusing because of the two figures have a different X and Y scale, careful inspection shows that it takes approximately 50 epochs to reach a NLL of 0.12 in both models. Based on this observation, I can’t conclude that batch normalization yields faster convergence. 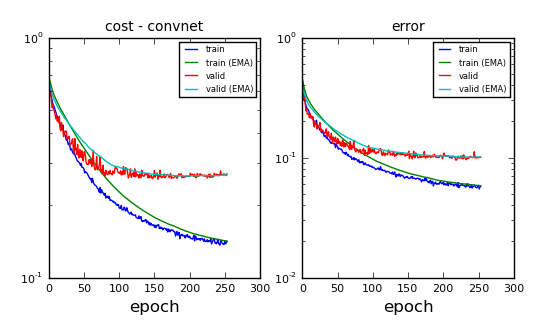 I did however get a significantly improved error rate with this model, which suggest it might help. One notable thing I must add is that I did significantly more hyper-parameter exploration on this model than the vanilla convnet I implemented. In class, Kyle suggested that much larger learning rates can be used with this method. This is an obvious next step and I’ll report the observation I made in my next post.